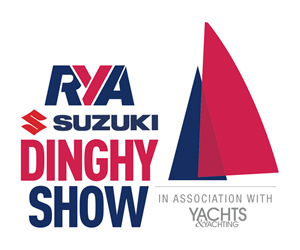 The Dinghy Show 2014 or rather the RYA Suzuki Dinghy Show will be running at the Alexandra Palace the first weekend in March. So what does the dinghy show 2014 have to offer the dinghy sailing enthusiast? It claims to be the only show in the world dedicated to dinghy sailing with hundreds of sailing clubs and associations, chandlers and boat builders, workshops and a whole raft of exhibitors, all under the one roof of the stunning Alexandra Palace. Last year over 8,000 visitors walked through Palm Court and it is hoped this year numbers will exceed this figure. At the Dinghy Show 2014 Team Cobalt, will be on show in Palm Court. The small hydrofoil catamaran should excite the adrenaline junkies. Chat with the team and marvel at this 200kg, carbon fibre catamaran. The RS Sailing Simulator is back again in the Panorama Hall. This full size RS Quba simulator gives the sailor the chance to experience the feeling and movement of sailing in a controlled, dry environment. Another popular stand is the RYA Magic Marine Trapeze Rig. The rig, especially designed for the RYA Dinghy Show, gives visitors the chance to try out harnesses and test their trapezing skills. Some of the old show favourites are also back including the Holt Blow Boat Challenge, Boat repairs workshops, the kids Treasure Hunt, and in the Panorama Hall RYA experts on hand to answer any and all dinghy sailing questions you may have. Alexandra Palace is situated between Muswell Hill and Wood Green in North London. It has it’s own train station located at the Wood Green entrance to the Park. A regular train service runs direct from Moorgate (weekdays only) or from Kings Cross, changing at Finsbury Park. Wood Green is the nearest underground station on the Piccadilly Line. (journey time is 20 minutes from Piccadilly Circus). Exit Wood Green Station and go to bus stop A to pick up the W3 bus up the hill to Alexandra Palace. Lovesail member RogerDee has kindly submitted a diary he kept during a Summer sailing trip he took last year. He travelled from Barry in Wales down to La Rochelle in France. A wonderful trip and a great diary. Boat lifted by travel hoist and placed on marine railway. Launched on suitable tide and weather. Borrowed mooring briefly in Barry harbour before departure. Dried out in inner harbour alongside north wall. Walked around town. Picked up mooring in Lundy anchorage with advice from Lundy Warden. Lundy is now a marine nature reserve. Row ashore, landing at tiny steep slipway at the base of the new jetty built for the supply ship, MS Oldenburg. Explore usual haunts ashore. There are always far too many people on the Island these days: walking, bird watching, rock pooling, rock climbing, scuba diving, etc. An easy sail, but have to loose time to avoid entering at night before or near low water. An alongside berth inside the harbour, which is now gated to avoid the boats drying out over low water. The following day, we hire cycles for the Camel Trail, along the old railway line. Padstow to around Land’s End to Newlyn. The wind was just north of west and so we used the motor for a little assistance while sailing to windward to keep going and well on the wind to get aroundCapeCornwall before turning south. Conditions can be bad offLand’s End, but after turning south the wind and tide were with us, and not very strong. 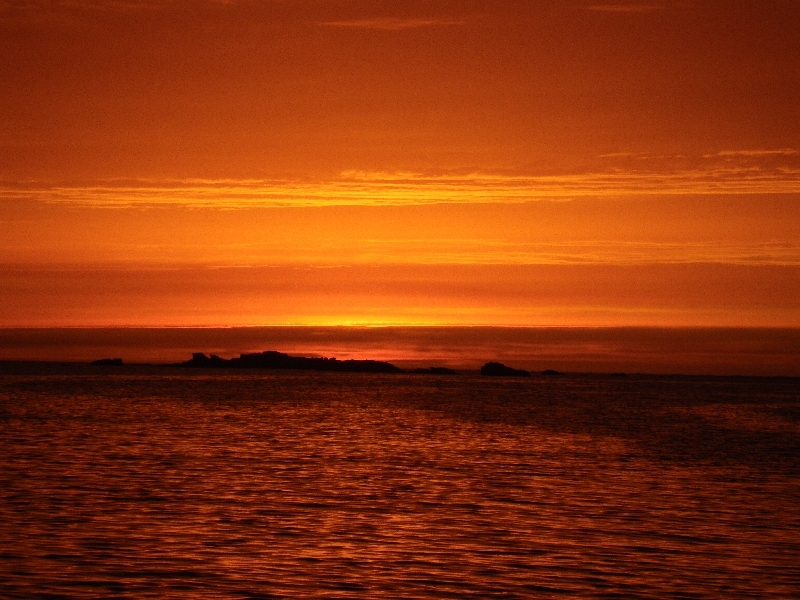 We approached and anchored off Newlyn (as we thought) in the dark. On the approach I identified the Newlyn harbour light as a white light flashing once every 5 seconds. I went below for 5 minutes, leaving my crew to helm and keep lookout. When I re-appeared on deck I again re-identified the Newlyn light, which was perhaps a little further north than I had expected. There was a confusion of shore lights, but I was sure of the identification of the Newlyn light. We anchored off the moorings outside the harbour. I had not been to Newlyn since the harbour had been improved and made available to yachts, as a condition for receiving EU development money, and the pilot book said nothing about any moorings off the harbour. However, we were both tired after a long day and half a night. The following morning we rowed ashore in the dinghy. The penny eventually dropped that we had not arrived at Newlyn, but at Penzance! When we rowed back to the boat I checked the chart: two harbours very close together with exactly the same light characteristics! I felt a little less stupid. The previous night I had seen no reason to switch on the software chart plotter since I thought that old-fashioned navigation methods quite sufficient. I had definitely not expected two harbours a few miles apart with the same light characteristic. Later I emailed Trinity House to express my concern. However, they apparently do not share my concerns! I will approach the Royal Yachting Association, RYA, sometime soon and see what they think. I do know that no situation like this would exist in air navigation. We lost a day in Newlyn because I wished for better weather than was current, in order to cross the English Channel(or La Manche, as the French call it). Newlyn is a sleepy, slightly run-down village in Cornwall. It used to have a harbour dedicated to fishermen. However due to its location it is an important cross-roads for yachts travelling around Land’s End, either north-south or east-west. It will soon be bursting at the seams with yachts, and hopefully looking a little more prosperous than at present, but no doubt more expensive. 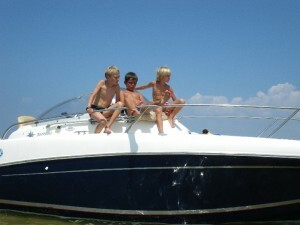 I understand that it was a condition of the European Union, EU, re-development money that yachtsmen would be welcomed. The following day, the westerly wind, not too strong, was just right for our crossing. In the middle of the channel we had to give way to a coaster who should have altered course slightly to avoid us, but evidently had no intention of doing so. As we approached the French coast, I tried more than once to check in with the French Coastguard, but could get no response on the VHF radio. I could hear other radio traffic quite clearly. Was it a problem with the radio, or just the French not bothering to talk to an English voice? The wind had dropped slightly and the tide was with us. Unfortunately, the visibility had now reduced, and at one point we were a little too close to a French fishing boat. If there was to be any weather problems I had planned to enter L’Aber-Wrac’h, a port further to the east on the north coast of the Brest peninsular, but now the destination was L’Aber-Ildut on the west side of the peninsular. 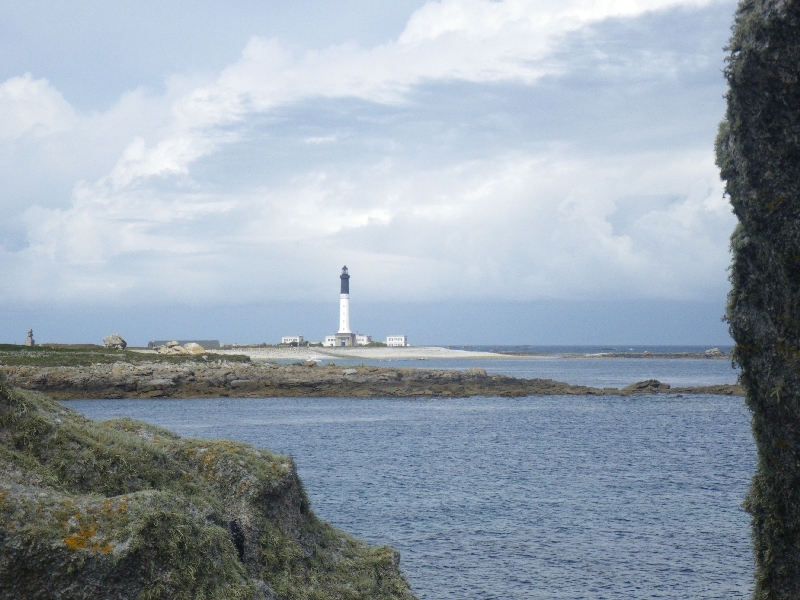 By luck the timing of the tide was exactly right for us to pass through the Chenal du Four, east of the Île d’Ouessant (or “Ushant”, as the Brits say), and the wind was also was just right. 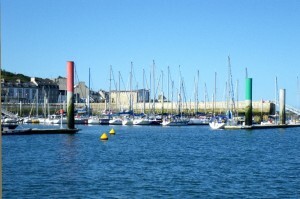 We passed through this treacherous channel without a problem and landed at Camaret, a beautiful harbour. 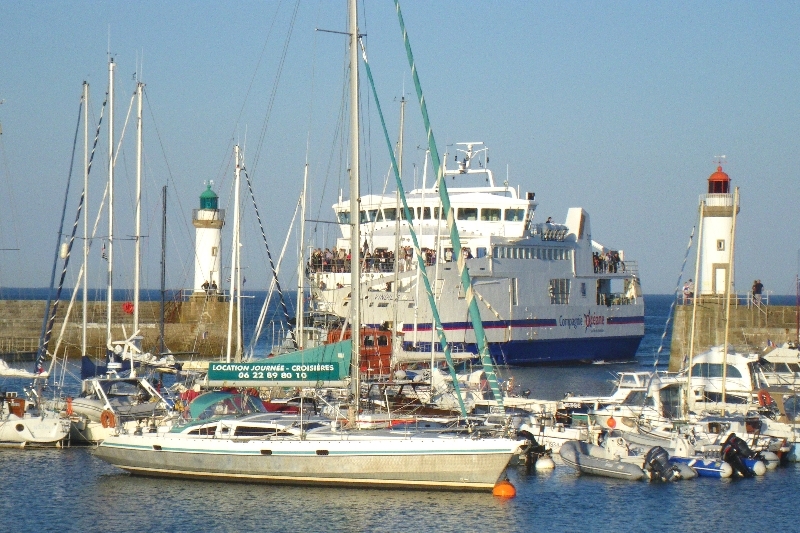 Camaret to Port Tudy on L’Île de Groix. 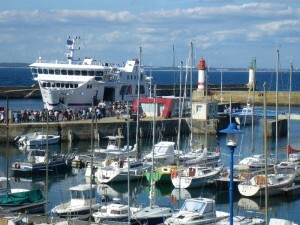 Our new friends were keen to set off the following day towards the Île de Groix. It was a long sail, over 100 nautical miles. 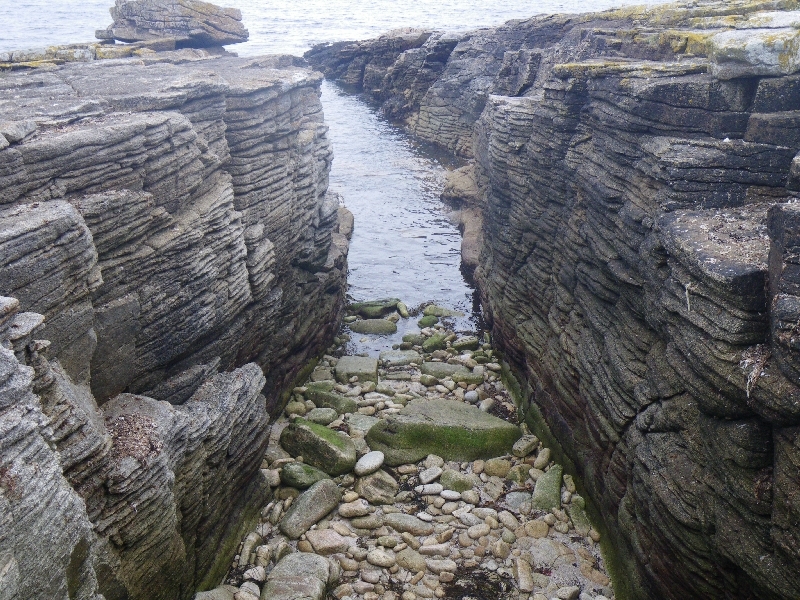 Our early departure was necessitated by the tidal streams at the Raz de Sein. We passed the Îles de Glénan. However, we could visit them on our journey home. 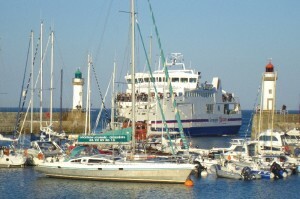 L’Île de Groix is an island very close to the French mainland and there were trippers there by the hundreds, and ferries every hour or so. We hired bicycles and toured the Island. The following day our friends departed westwards for home. La Palais to Ster-Wenn on Belle Île. 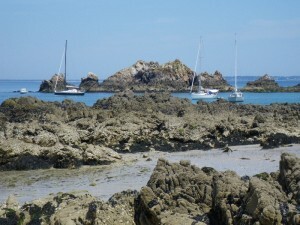 For us, it was a short hop to this fantastic little anchorage hiding in the rocks, invisible from seaward. Here we met a French lady in a boat smaller than Katy Dee (!). She lived at Bono in the Golfe de Morbihan and she encouraged us to go that way. 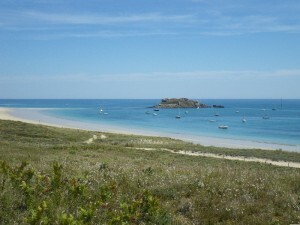 Ster-Wenn to Île de Houat. We anchored off what the pilot book said was the best beach in Atlantic France, and explored ashore. Île de Houat to Bono. 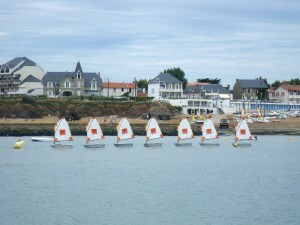 This meant entering the Golfe de Morbihan, where, at the entrance, it is essential to have the tide with us, and the wind not too strongly against us. The stream zoomed us up to Bono. We arrived just before dark and moored against the harbour wall. Because we needed to depart early the following day on the morning ebb we effectively had a free berth. Bono to Île de Houat. I reserved further playing in the delightful Golfe de Morbihan for the return trip. One of the problems with anchoring of the coast of Atlantic France is that is the daytime wind often changes to a strong NE-ly land breeze about 0300 at night, necessitating a pyjama party to move the boat to another anchorage in the middle of the night. However, because of the darkness, lack of lights on the buoyage, and the many rocks this is not always possible. After the land breeze in the night, the wind is often flat calm again by 0600. Although there are sea breezes and land breezes off the coast of theUK,France has a far greater hinterland behind its coastline, and also the sun is stronger, giving a greater diurnal temperature range than in the UK, so the night breezes are stronger. 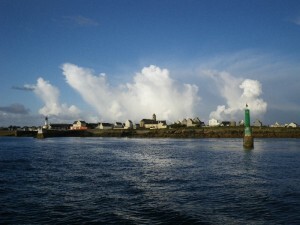 Île de Houat to Joinville on Île de Yeu. 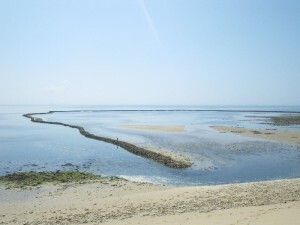 Les Sables de L’Olonne to Île de Ré. Although the wind was quite strong, because it was determinedly westerly, we anchored as shallow as we dared (allowing for the reduction of depth at low tide) in the shallow bay on the south side of the Island, just as it was getting dusk. We had a good night’s sleep. Île de Ré to La Rochelle. We had 3 nights here. It is very expensive (even for the French) but the third night is free, so it becomes just expensive. La Rochelle is a great tourist attraction and there are street artists and activities until the early hours. Twin towers guard the old harbour, le Vieux Port, which has lots of history. In times past La Rochelle was a protestant (Huguenot) stronghold in Catholic France. 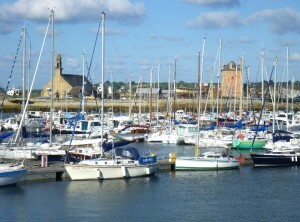 La Rochelle to Port des Barques. We passed the Île d’Aix, and various other historic forts defending the sea channel, Le Chenal d’Antioche, into old military town of Rochefort on the River Charente. In only a slight wind we crossed the bar and entered theCharente just after low water with only a little anxiety as to the depth of water over the bar. With the failing light and the river unlit we felt we could not proceed on the flood tide all the way to Rochefort. The pilot book advised that there was commercial traffic, even at night, so we needed to moor or anchor in the river, which has very fast tidal streams and very muddy water. I preferred a mooring, and one seemed to be available off Port des Barques. As soon as we picked up a mooring and settled ourselves, the owner of the mooring, a fisherman, appeared, and was angry. However, there really was no problem because we were very happy to move. He calmed down and we moved to a mooring of his suggestion. No sooner had we settled ourselves down there when a slightly official looking boat requested we move to yet another mooring. As soon as we had done that he returned again to demand a totally unreasonable number of Euros from us. I explained to him as best my French would allow that we would be anchoring elsewhere. He said that we could not anchor in the river. We departed. I did not like to choose a vacant mooring on the other side of the river within his visual range, so we proceeded up the river to a spot where there was a bend in the river just out of his view, and which was also clear of the river’s navigation (as I judged by the transit posts). I expected the stream to slacken as low tide approached. However, the stream continued to run fast and we went aground in soft mud a hour or so before low water, with the tide still swilling around us. I was anxious about the future strain on the bilge keels as the strong tidal stream would push us around when it reversed direction just as strongly and the keels would still be firmly aground. When we re-floated I took the opportunity to anchor off a little deeper to avoid drying out again over night. We set an anchor light, but there was no traffic during the night. 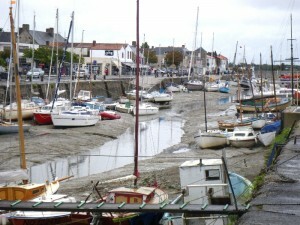 Port des Barques to Rochefort. 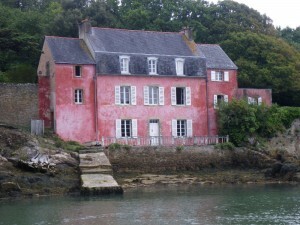 The following day, because of the light wind and the extremely strong tidal stream we motored up the river to Rochefort. Most mooring buoys were pulled under by the strong stream. We were in good time for the Cruising Association’s meeting which started the following evening. Rochefort is good enough to allow boats a free night, both at the Ropery’s (La Corderie Royale) jetty and also at the waiting pontoon for Rochefort marina. The salt water of the river is coloured milky white. This contrasts greatly in colour with the clear fresh water that runs into the marina from the other end. When the marina gates open on the last of the flood the two waters mix, but the salt water is heavier and sinks below the fresh water. So the surface water runs out of the marina, downstream on the flood tide! (This fresh water is displaced by a greater volume of salt water running at depth into the marina. This is a similar effect to that at Bristol in the Bristol Channel, and no doubt to many other similar ports with a gate on a river). The festivities and socialising of the CA meeting lasted 4 days. There was much companionship, social visits to other members’ yachts, much advice given and much received. I was particularly interested in the idea that if you purchased a Kindle 3G keyboard for ₤150, as well as a book reader you also had a slow and clunky, but worldwide and free, 3G-mobile internet access for email and weather forecasts. Pascal, the Harbour Master, had also negotiated for us free entry into the many museums, the Ropery, and other historical sites of Rochefort. I live at Chathamin Kent, UK. It is an old naval town built on a river and in the past given to naval boat building, and the production and storage of munitions. Rochefort is similarly an old naval fortified town on a long river with a military history of boatbuilding and armaments. 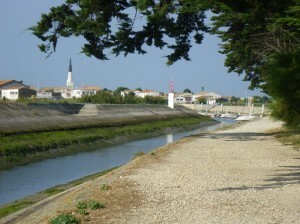 The islands of Ré and Oleron have lighthouses (or “phares”) to guide the ships through the dangerous Chenal d’Antioche and into the River Charente. Just likeChatham, which defended London against the French and the Dutch in times past, the long, shallow, winding river spelt the death of the dockyard when ships became bigger. Rochefort’s naval life was extended by a (very sensible) French policy around 1900 to have many smaller ships (with shallower draft) rather than a few big ones, which could not have been built or supplied by Rochefort. At the end of the CA meeting at Rochefort my crew departed to earn some money by farming and assisting at his village pub, in order to see himself through another year at university, now that his Dad’s company had been taken over by the receiver in the financially difficult times of the UK. There was now a westerly gale blowing, and this made any exit over the Charente’s bar dangerous. We were all storm bound, making a week in all at Rochefort. Rochefort offers a 3rd night free. This is a pleasant custom practised by some French marinas, but not many British marinas, I believe. The Harbour Master also offered CA attendees an additional free night’s berthing. So we had good value at Rochefort! Rochefort to La Rochelle. Courtesy of the waiting pontoon I stayed another night at Rochefort. (This time, rather than waiting for the marina gates to open, I was waiting for the river to ebb, of course!). The following morning I set off down river in company with another CA member’s boat, which happened to lock out just as I was setting off from the waiting pontoon. Both of us were departing just before high water. The wind was NW but force 4, although it increased slightly as we cleared the land, and because we were being swept along by the tide into the wind. The Charente bar was a little lumpy but not dangerous. Some weeks ago, I had discovered that the “good” autopilot had broken when I placed it on the cockpit seat and it had rolled onto the cockpit floor. I had not been able to get the “good” autopilot repaired because all good Frenchmen go on holiday in July and August. I later had this autopilot repaired in the UK at vast expense. I had also discovered that the second autopilot, which I had purchased as a backup, was not really very good at all, despite, as I saw it, being recommended by Mr Simrad for my yacht. This second autopilot I later returned to Mr Simrad as being unsuitable for my boat, and he reluctant returned my purchase money. The current problem was: how do I go to the loo when the autopilot does not work and I am sailing single-handed in a river? One answer is to balance up the sails and get the tiller position exactly correctly before dashing below, while still keeping an eye through the portholes on other boats and the river bank! But don’t be too long, in case there is a gust of wind, or even a lull. My companion now seemed to be sailing along effortlessly with just his mainsail. I had reefed down and was still motor-sailing to windward, using the engine to keep up and eventually to overtake him. At last I slowed down to tell him as he passed me that I was turning off for La Rochelle. He said he was going to Saint-Martin-de-Ré. I was tired of hand-sailing to windward. I tried to approach La Rochelle but the path was completely barred by a mass of laser dinghies all rushing around a triangular course. It was the Laser Youth World Championships. While waiting I decided to start up my computer for its chart plotter program, because avoiding the lasers had disorientated my navigation. Unfortunately while I was doing this, I missed my gap and the lasers were all buzzing around again. I thought that I had almost got through the mêlée without upsetting anybody when a RIB ordered me off in the opposite direction. I think that I might have been more trouble to them by going the way they wanted, but I did followed his instructions. 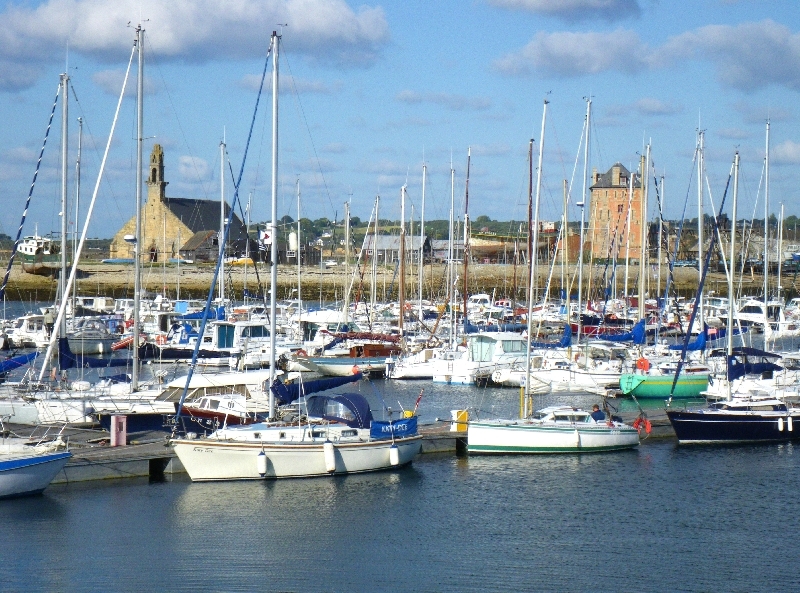 Eventually I entered the new marina, called Minimes, at La Rochelle, but then decide that my best chance of finding an ex Rochefort CA boat was to enter the old harbour between the famous twin towers. In the event, another Roger did leave a message on my boat, but I never managed to find them on their boat at a sociable hour, and so I never met up with them again. I stayed only one night at La Rochelle. I would have stayed more if it was a little cheaper. Without a crew my running expenses had doubled! I did however meet up with a retired R.Y.A. Chief Instructor & Examiner, who many years ago had set up the RYA’s Cruiser Training Scheme, based upon his experiences in the Joint Services Training Scheme. He asked me whether I been to Ars-en-Ré before. I could not help him because I had not. In the end he decided that he could not risk going there as he might go aground. In fact, unusually, there are two bars. Because of the now neap tides, he would have crossed the first into The Pool, but not the second into the marinas. La Rochelle to anchorage SE of Île de Ré. 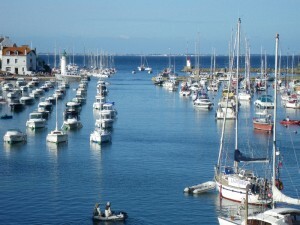 In France most marinas do not necessarily wish you to leave by midday as the British marinas insist, so I departed from La Rochelle in the late afternoon and anchored SE of Ré, just south of the enormously high bridge to the Island. I rowed ashore for a walk. I was starting to feel a little lonely. Near high water I motor-sailed through the channel to Ars-en-Ré. After going into the marina I discovered that the waiting pontoon was free for one night, so I retraced my steps! While I was there a French boat under tow came alongside. She had been towed in because the motor would not start. I assisted in starting it and the skipper invited me back to his house in the village. His English was a lot better than my French, and we got on very well. 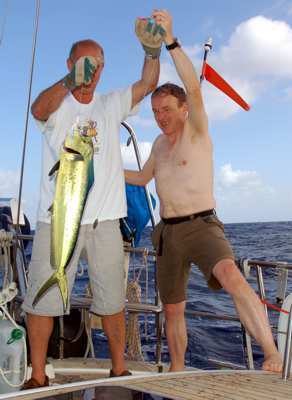 We arranged a sail the next day in my yacht, to be followed by dinner at his house. This seemed a very good deal to me. He was a retired doctor whose father had been seriously injured in the First World War. His house was a holiday house and he lived in Paris. I discovered that many other people had similar arrangements. Property on the coast now is enormously expensive, but he had purchased years ago. I wanted him to help me find the passage across the sandbank at the entrance to the bay. We found the short-cut, and he also pointed out the many German pillboxes which remain, most of which are sloping because the sand has been undermined by the sea. One is now a house, presumably a holiday house. It was a great day’s sailing and a great dinner, with much to chat about. I had berthed Katie Dee in the marina. The following day I went into the village marina, which has a sill to retain water for the boats over low tide. Both marinas are owned by the same people. 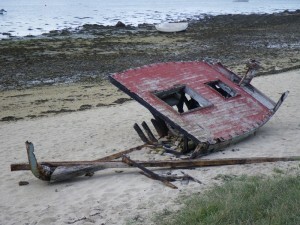 The next few nights I spent anchored in “The Pool” at Ré, or aground on a nearby sandbank. I spent the days pottering on my own on the waters around the Island. In particular, Le Banc de Boucheron provided much entertainment. A spring tide at the weekend is a good excuse to have a BBQ on the Bank at low water. Île de Ré is my favourite French island. 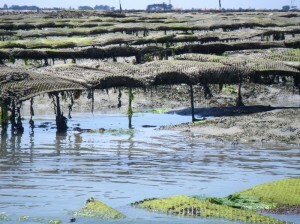 Unfortunately for sailors, some of the would-be anchorage in Île de Ré is oyster beds. My French doctor friend told me “this year the oysters are sick”. 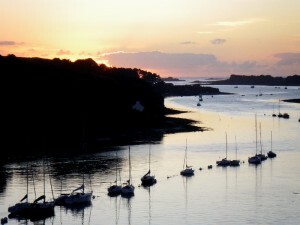 I now almost retraced my steps, back to the Golfe de Morbihan. However I also had a great time exploring le Payréa river just to the south of Bourgenay. I anchored KTD off and rowed in the dinghy up the river about 2 hours before high water, expecting to return 2 hours after high water. However, I should have known better, because it does not always work like that! Here is the same situation as the Rip at Port Phillip Heads in Victoria, Australia. The stream changes 3 hours later than you would ordinarily expect. This is because of the narrow entrance channel and the large area of water in the hinterland. The tidal levels inside the bay lag 3 hours behind those outside in the ocean. In southern Ireland, Barloge / Lough Hyne works in the same way. That night I visited Bourgenay, where I did not feel very welcome. I arrived after the Harbour Mistress had gone home and notice boards advised me that all (!) the visitors’ spaces were apparently reserved for yachts supposedly arriving here after a race. I put the boat onto the fuel berth and departed before the race boats or the harbour mistress arrived the following day. I visited Saint Giles et Croix de Vie, which is from where the Vendé Globe race starts, and also Île de Noirmontier, where I was storm bound for nearly a week. On a very wet and windy day I cycled to Noirmontier-en-Île and across the causeway, Route du Gois, and back – just before the tide covered the causeway. I had now extended my cruise from 2 to 3 months. I was trying to find a crew on the internet, without a lot of success. My access to the internet was intermittent. I had plenty of people who would love to come at almost any price from almost any country but only for 2 or 3 weeks. My main reason for wanting additional crew was to cross back over the English Channel, and for the Bristol Channel. While I had been having sun and fair wind in France, the UK had received one low after another. In the event, an American was interested in crewing for me. He was in Amsterdam, which is from where his last apparent trip had not departed. He seemed very keen, and (most importantly) he was available until the end of September. He was even more penny-pinching than I was! We corresponded on the internet and did not speak on the phone until the day before we were due to meet. I had told him by email that if he was coming by train then Vannes in the Golfe de Morbihan was the easiest place to meet. Vannes is pronounced like: hold your nose while saying “Van”; but obviously if you are an American it is pronounced “Van-nes”. Because our correspondence had been by email, he was a bit concerned when I suggested verbally that he should go to this apparently new place called “Van” rather than the “Van-nes” of his rail ticket. (I never did manage to pronounce Sauzon correctly to the French ear). 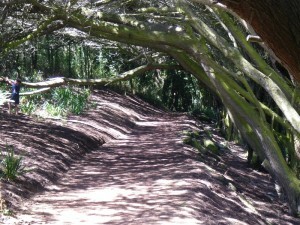 We biked around the Island and then the following day moved the boat to Ster-Wenn. After that we were visited the delightful Îles de Glénan. This group of low-lying islands is a bit like the Isles of Scilly, but has many more, smaller islands and many more anchorages. It was fabulous there, and the anchorages were free. The beaches were white, being composed of shells ground by the waves. Some of the larger islands are taken over by the famous Glénan School of Sailing. I remember many years ago when my parents and I were cruising the south-west coast of Ireland, a Glénan boat with no engine, and smaller than our 26-foot Westerly Centaur, would set off before us and arrive after us at the next harbour along the coast. After Glénan we visited Loctudy on the mainland, before heading north and passing the Pointe de Penmarch, which has a reputation for being a dividing line in the weather – sunny to the south and east, but wet and windy to the north. We entered Sainte-Evette after dark, but were a little confused, finding the leading lights not quite as we expected. 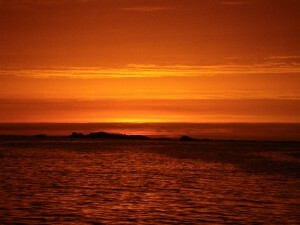 I am pleased to say that the weather and our timing we exactly right for the Raz de Sein. 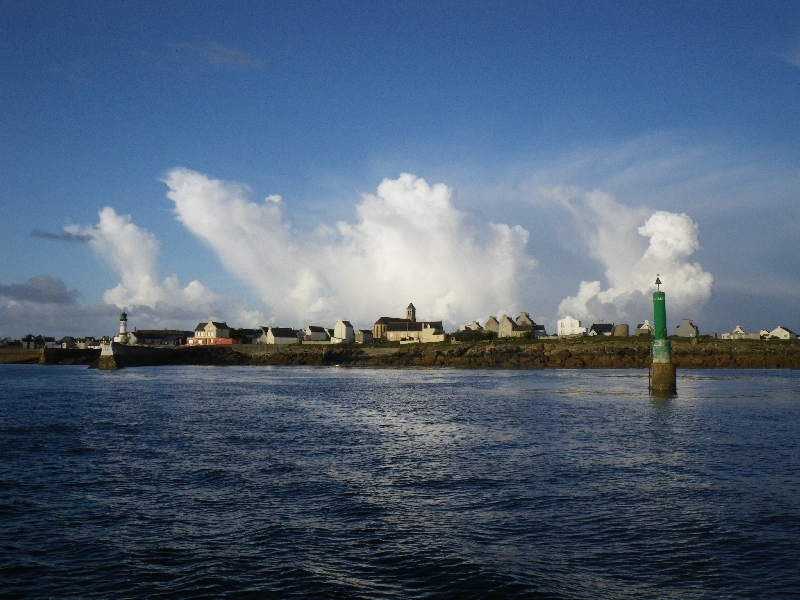 We wished to enter the harbour on the Île de Sein so we had to pass the Raz de Sein on a slack water that became a northbound (i.e. flood) tide. I had previously purchased some French tidal atlases at the recommendation of the enormously useful Royal Cruising Club’s pilot book “Atlantic France”. The Island is very low-lying and has been inundated in the past, I guess during Atlantic storms and equinoctial tides. The history of the islanders during World War II is very interesting. All the men of the Island joined up at General de Gaul’s call to arms. They consisted one quarter of his force. 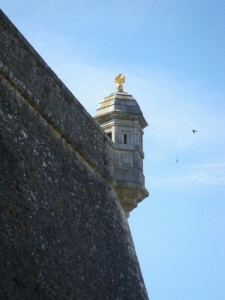 He asked, “Where is this Île de Sein. It is a quarter of France”. After a few days exploring ashore there, it was time to re-visit Camaret, and then to brave Le Chenal du Four with good timing and good weather again. 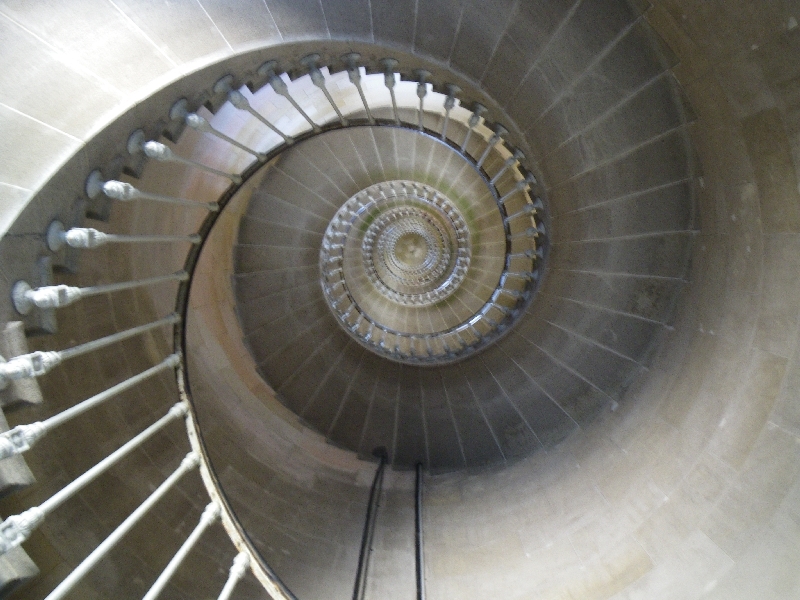 We briefly looked into and out of Le Conquet and then made for L’Aber-Ildut. Nobody is allowed to use what could be a perfectly good visitors’ pontoon. My suspicion as to the harbour’s mental health was confirmed by a local volunteering a similar view to mine, and without my encouragement or even questioning. The French do a lot of seaweed harvesting on the Brest coastline. Next we visited “The Land of the Abers”, first L’Aber-Wrac’h. In order to get there I chose to take the inshore Portsall Passage. I had a pilot book that gave clear instructions, but I could not distinguish all the landmarks. Perhaps it was because I was too early on the tide (and therefore lower in the water than I might have been an hour or so later). However, I shall think carefully about going that way again. I had thought that it might have been more comfortable in a blow than outside, but now I am not so sure that I would wish to be in this inshore passage in a blow. One reason why I delayed crossing back to the UK immediately was that I was very keen to enter L’Aberwrac’h in good weather, because I might wish to enter in a bad weather at a later date. Apparently it is a harbour which is available in any weather and in any state of tide, and there are not too many of those nearby. What a beautiful place! We had one night in the newly-expanded marina and then a couple of nights free, higher up the river. My highly moral American friend was hooked on the internet (to find his next trip) and at one point we were searching the river, myself at the helm and Chris on this computer, trying to find the best unprotected domestic wireless internet site to get a connection. I also wanted to keep an eye on the weather for the impending crossing of the English Channel. We did not succeed in our mission! (I have already purchased a WiFi booster aerial for next year). The following day we had a bit of early morning fog in the higher reaches of the river. The next leg was west and south to L’Aber-Benoit. I let my American friend pretend to be skipper. For my liking, he was not quite frightened enough of rocks and lee shores! Also, he did not still quite understand the different responsibilities of helmsman and navigator, in that (to my way of thinking) a helmsman merely steers a heading provided by the navigator. However, I guess that in a few years all that will be history, because the navigator’s table seems to be migrating out to the console in front of the helmsman. Now, on a superb easterly force 4 forecast, we set off for the Isles of Scilly, but I kept to windward initially to allow for a diversion into Newlyn if the weather should turn adverse. (I always like to keep up wind, and also up tide, if at all possible). We had a trouble-free passage, but I should have called my crew earlier on the approach to the Scillies, because I was not sufficiently aware of the strong adverse tide which we were about to encounter as we passed between St Mary’s Island and the Island of Gough. I should have gybed much earlier and avoided having to battle so much against the adverse tide. The autopilot could not be used downwind, and I had been tied to the helm unable to get to the navigation table. Well that’s my excuse. We spent a few days anchored just north of the moorings in St Mary’s harbour. We did some shopping ashore and watched a brilliant performance of a play, but I am sorry to say that its title escapes me now. We managed to get lost when walking back in the dark to where we had left the dinghy earlier. The following day we crossed the Tresco Flats and moored very high in Green Bay. We thoroughly explored the islands of Tresco with its Abbey Gardens and Bryher because we were here for a few days longer than we had expected, due to bad weather. We became friendly with a charming French couple in a 35-foot aluminium yacht with a lifting keel. In France we had observed that the French seem keener on aluminium hulls than the British. When they eventually returned to France the skipper emailed me to say that they had sailed right around both the Île d’Ouessant and the Île de Sein to their home port of Port la Forêt. In which case, they must have done battle with the traffic in the separation scheme off Ouessant. I have not heard of anybody taking that route before. We walked around the islands of Bryher and Treso more than once, and had a trip to the small island of Samson, which I have not visited before. Samson is now uninhabited, and is apparently the next island to be divided into two by the inundations of the sea. The autumnal equinoctial spring tides were due in a week or so, and a walking party was planned between Bryher and Tresco. We hoped to be long gone if only the weather would subside. I was keen to return to Barry, so when the wind dropped to a force 6 we set off, but there was still a big sea running. Luckily the tide was with the wind when we set off, but I think that was more luck than judgement, and the sea did calm down a little once we were clear of the Scillies. There are overfalls marked on the chart just north of Round Island. Also, we should have given the rough water clearly marked on the chart around Cape Cornwall a greater offing, but nothing too horrible happened. We arrived at Padstow, again in the middle of the night. We enjoyed what for me was another cycle along the Camel Trail, and I attended a very informative lecture at the local fishery about fish stock monitoring and conservation. I am pleased to say that some local fishermen were very interested, which after all does make good sense. (I do not always see eye-to-eye with fishermen). While awaiting the weather at Padstow we had many walks ashore, on both sides of the Camel estuary. After a few days we locked out and waited at a mooring in The Pool, hoping that the weather would be suitable for us to cross the bar. Unfortunately the waves on the bar still looked horrible and after one night we returned near high water into the harbour. When I asked on the radio for permission to enter the harbour, the Harbour Master asked whether we had had a good trip! And, as is the custom, he also charged us as much for being on a buoy in The Pool as for being in the harbour itself. So we spent a fortune, storm-bound in Padstow for a week. Next was Clovelly. However, because of the ground swell caused by the recent week’s bad weather, I did not wish to take the ground inside the harbour. I motored in and hailed a fisherman, who kindly advise me of the same. He also told me what I wanted to know, namely which mooring in Clovelly Roads I might pick up. He kindly offered me his own, but I wished to choose another. We settled the boat on the mooring and rowed ashore. My American friend did not seem keen to come, but I am sure that he enjoyed himself because Clovelly is unique. It is an old-fashioned village clinging to a cliff. The small harbour has a very high and very thick harbour wall, and it needs to be both because of the force of the waves in a NW gale, especially in the winter storms. Finally, we planned to return from Clovelly to Barry in one hop. This would be perfectly possible provided the wind is not directly against us. The forecast was for SE not E, so I thought this a reasonable goal. However, the wind became resolutely easterly, and we needed all haste to get to Barry before the tide turned to ebb. I started the motor at Morte Point and we motor-sailed all the way back to Barry. For the last hour the wind finally turned a little to the SE which saved the day because we were just able to make it back to Barry in time. I have no mooring in Barry these days and so we borrowed the pilot boats’ mooring, with their permission. It is a big hassle laying moorings, made more difficult by my presence in Australia at the vital time in the very early spring. So these days I do not lay a mooring, but just “dry sail”. Unfortunately the winter compound was not yet ready for boats to be brought ashore, so we had to wait using another borrowed mooring, as suggested by Barry Yacht Club’s Mooring Master. Finally we were able to put Katy Dee on the marine railway trolley and hoist her ashore into her spot for the winter. I was keen to attend the Southampton boat Show (since I always miss the London Boat Show by being in Australia in January). Chris was also keen to attend the Show because he wanted to talk to charter boat operators. (But he later told me than there was not much information to be gleaned). My car had been at the Yacht Club for 3 months, but it started first time! After the Show I returned to winterise the boat and especially the engine, ready for its cold winter months in the UK when I am in the sunshine of Australia. Cruising is never completely free from some concerns, usually about the weather. 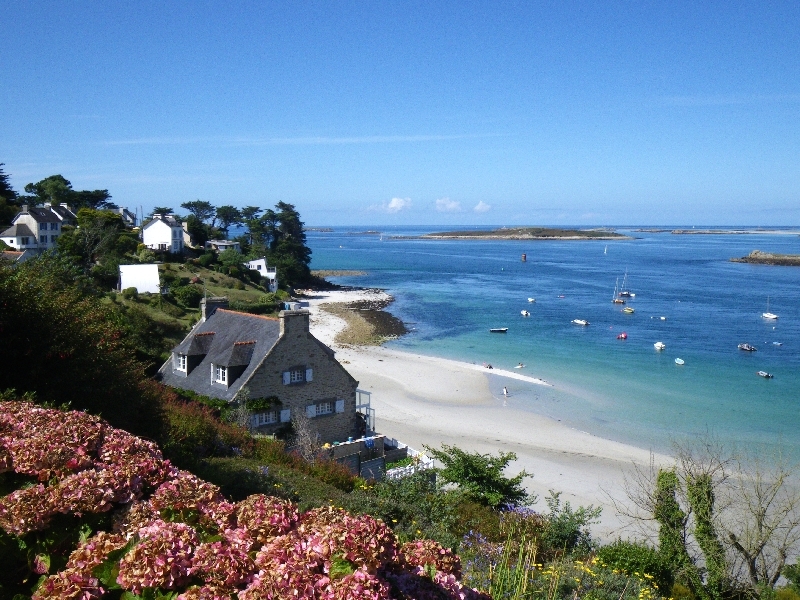 However, Katy Dee had had a fantastic summer exploring the islands of Atlantic France and the Isles of Scilly. The ARC race is one of the biggest trans-ocean yacht races in the world. Starting this year in November from Las Palmas Gran Canaria and using the North-East trade winds, over 200 yachts will travel the 2700 nautical mile route to finish in St Lucia about 3 weeks later. The race is open to anyone that has had a minimum of 500nm cruising experience. Also the Skipper an one other crew member need to have undertaken a minimum level of training and the boat needs to have certain safety and communication equipment on board. The World Cruising Club organise a series of seminars and training courses to help prepare the entrants for the rally. It also helps if you are slightly unhinged! It is an annual event and very popular. Entries are taken from October in the year before the race with the deadline for entries being 1st April in the year of the race. However, it is advised to book as soon as possible. Register with the ARC Race website to receive notification when the entry list opens. To get a flavour of the race, Lovesail was lucky enough to post a daily diary from the crew of Casamara, a Discovery 55 which took part in the race. To read the entries just see here or look under Sailing and Boating Events and then Racing at the top of this page. For more information visit the World Cruising Club website where you can also follow the fleet as they cross the Atlantic.